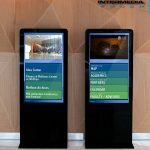 Why Bring Interactive Digital Signage Drawings to Your Casino? Differentiate your casino by offering your players an interactive digital signage drawings and software experience through touch-screen promotions. By taking the step to go interactive you provide your players with an unforgettable, winning experience. This is possible because of dynamic game content that is custom designed to meet the exact needs of the casino. For example, Seminole Casino Hollywood uses a game called “Angry Turkeys Takes Las Vegas”, which is designed to provide players with a visually colorful and rewarding journey of winning and excitement.” In this game players launch colorful animated turkeys into the Las Vegas Skyline. Every launch yields the player cash or prizes as it knocks down pieces of landmark casinos”. By using interactive touch-screen technology, casinos can engage their player’s with impactful promotions, advertise key messaging about current and upcoming promotions, and provide an overall “wow” experience.